*I woke up with a bad cough so I texted Nikki and told her I would not be walking this morning. I don’t think I would have made it one circle around our route at KHS. *All morning at work I was feeling pretty lethargic, and coughing and not feeling great. I started feeling kind of achy, started getting the chills and kind of hot, too. I came home after lunch and slept all afternoon. That helped some. I did drag myself out of the house to attend our annual P.E.O. Christmas party at Michele Heyn Rauenhorst’s house. I picked up Christy and Dawn and we all had a nice time visiting over a delicious potluck dinner, then having a fun gift exchange, and then ending the evening being lead by MaryKay Lyons Hanson singing Christmas carols. 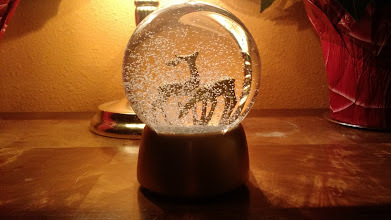 I received a big white teddy bear and a musical snow globe to add to Paul’s collection. *When I dropped her off after the party, Christy invited me in to see the progress on her shed in her backyard. Today they got electricity to it, so now it has heat and lights. It will be such a fun place to enjoy meals together once it is all finished. *My “go-to” Christmas potluck item for the last few years had been a Mini Sausage Wreath. You take little smokie sausages and wrap them in crescent roll dough, and bake it in the shape of a wreath. The you make a dipping sauce with cranberry sauce and bbq sauce. It is always a big hit. Here is a link to the recipe here.